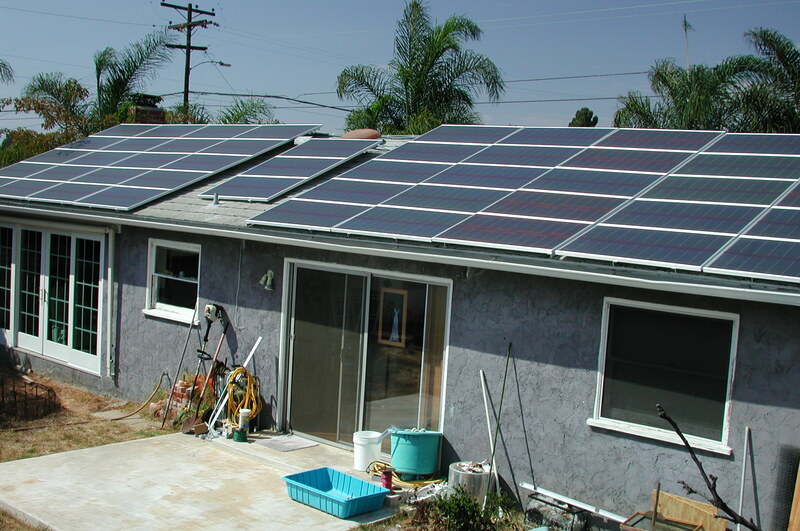 In the summer of 2001 we installed a 3 kilowatt solar power system. 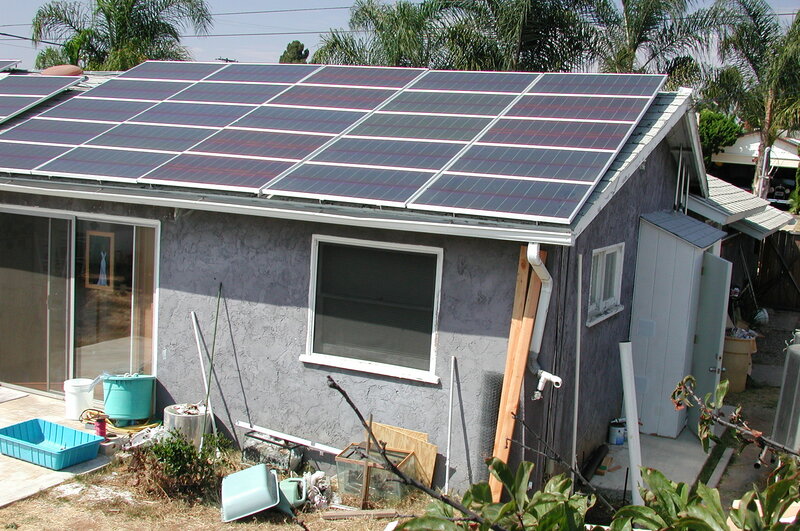 With all the threats of multiple blackouts, and a very generous 50% rebate from the state, we took the step of realizing one of my dreams of having a solar house. Total installed cost after rebate was $13,000. In addition we received a $2700 credit to our state taxes this year! The system is paying off already! The installed system so far supplies 77% of our electricity needs for the year. When you figure that most of the time its been running has been over the winter, we're doing pretty good. This summer I'll figure an actual yearly total and max the system out so we can be completely independent - my goal is to not pay an electric bill at all. Monthly bills so far have averaged $40. 25 of the 48 installed panels on the south facing roof. The electrical shed can be seen on the right. 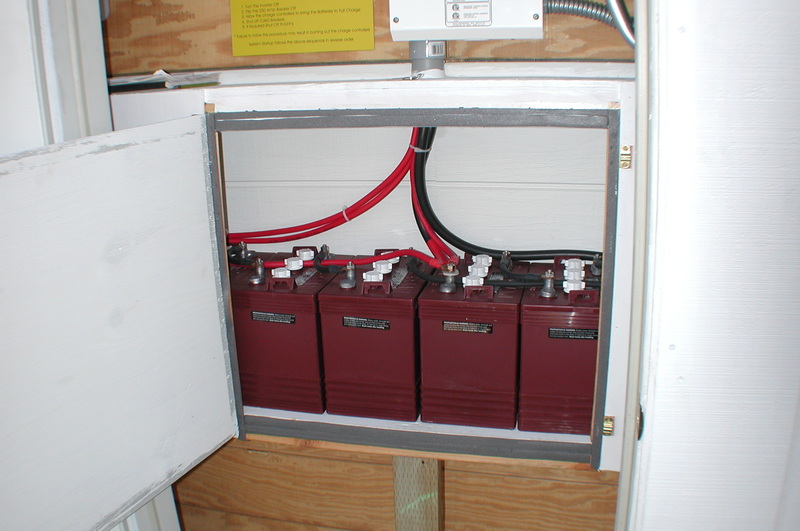 It houses the inverter, batteries, shutoffs and associated electrical gadgets to make the system run. All 48 panels are shown in this shot. I used United Solar US-64 panels. They are 64 watts each, and will produce reduced power on those cloudy and foggy winter and spring days we have. 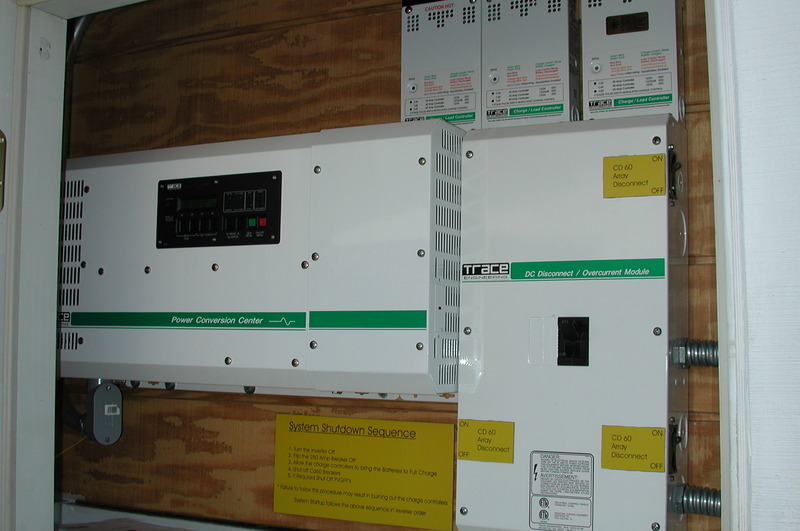 The Trace inverter, panel shutoff, breakers and charge controllers. The engraved sign has the system shutdown sequence so we dont damage the charge controllers by shutting components down in the wrong order. 8 220 amp hour batteries in case of power outage. The system acts like an un-interruptable power supply for the house. When the power goes out we get switched over to battery backup in milliseconds - we dont even know a blackout is occuring. The batteries will last us for two days without sun without modifying our electric usage. Of course if we are carefull about power usage, and sunny days - we could live without grid power indefinitely.